Any title released on the Sega Dreamcast in 2015 is probably a labour of love. As one of several bullet hell shooters from Hucast Games, Ghost Blade first appeared on that platform before settling into the more commercially viable realm of modern home consoles. Despite being German-made, the developers have done everything possible to pay tribute to the niche genre that Japan helped build; cute anime-style gals serve as protagonists and even the game’s title is sometimes stylistically written in katakana. This is a game that conjures up memories of days gone by, striving to emulate their quality without reinventing the wheel. 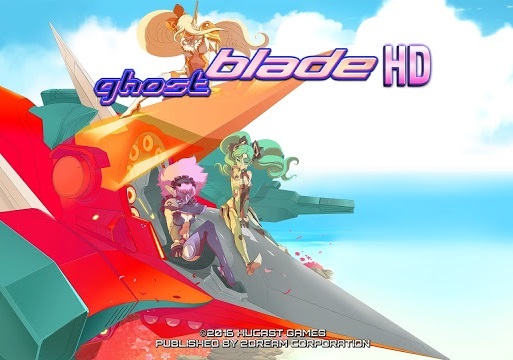 While Ghost Blade HD doesn’t quite match the genre’s peak, it’s absolutely a game worth pursuing for genre fans feeling ravenous for selection on PlayStation 4. It’s exactly what you’d expect from a tribute game, offering players a chance to strategically overcome endless barrages of projectiles. Along the way, you'll grab power-ups and any extra lives you find strewn about, which can subconsciously alter the player's course in a split second. There’s very little personality to get excited about beyond the occasional enemy design, as even the previously mentioned anime girls amount to little more than a couple static images. No goofy death quotes, charmingly nonsensical backstory, or anything of the sort here. Throw in a combo system, though, and the foundation is solid enough for a game of this scope. More remarkable is the minimalist character roster. The game does a respectable job of presenting balanced, unique spaceships with which to conduct the symphony of gunfire. All of them shoot in fairly conventional bullet formations, but their speed, range, and power diverge notably. The Rekka ship moves like molasses but packs a punch and can cover a solid range. The Milan moves like lightning, but is very much a straight-shooter with little room to clear up side foes. As you might guess, the titular Ghost ship is sort of a bridge between the extremes. While there's probably an objective "best" character with which to conquer the leaderboards (especially given that the chart doesn’t divide scores by character), all are delightful enough for basic consumption. If standard enemy and boss patterns were a tad more complex, the differences between these characters would be pronounced. They’d serve as the basis for dynamic scenarios, fundamentally altering how the player approaches situations. Ghost Blade HD instead lets you use the speedster almost exactly like you would the tank, meaning the character differences are more down to personal comfort than adapting. There’s nothing expressly wrong with this approach, but my philosophy has always been that a slim roster should strive for maximum diversity. Compare this to a game like Bullet Soul, where the skill demand is relatively low and characters can be unbalanced but you still need to actively acknowledge the protagonists’ shortcomings and milk their assets. 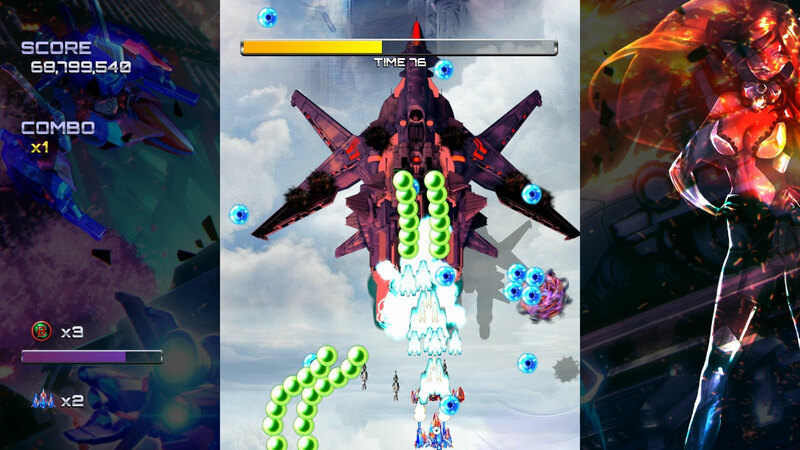 Despite this, Ghost Blade does present strategic options to the player beyond simply picking a vehicle and dancing about. As the levels here are decently long, there's a focus on swapping between spread fire and focused, laser-like beams to address foes with stamina. For times when the player feels overwhelmed, bombs can be deployed to grant temporary invincibility and wipe out nearby bogeys. One type of shot impedes movement while the other lets you maintain your speed, so there’s an engaging risk factor at play. For a genre in which gazing across the screen for half a second too long can cost a life, the need to juggle between attack and defence modes is simple yet oh so effective. Many bosses have weak points or destructible weaponry that should ensure intense showdowns, but even on hard, their movement patterns aren’t quite sophisticated enough to demand meaningful strategy. Even so, I applaud the developers for trying because I’ve fought my fair share of shoot ‘em up bosses that are merely about how long you can hold down one button and dodge. The game incorporates three difficulty settings so as to entice newcomers and veterans alike. A run through arcade mode will be terminated should you exhaust your supply of lives and credits. Most intriguingly, Ghost Blade adopts an active credit system akin to titles like Ether Vapour Remaster. That game allowed players to very gradually accrue lives and continues as a reward for losing. The idea is that, rather than grant immortality or permit the player to move on as Nintendo does in its platformers, the player should aim to surpass their limitations ever so slightly. By the time the player has tons of continues at their disposal, their skills bloom and the game’s pity becomes more of a convenience than a crutch. 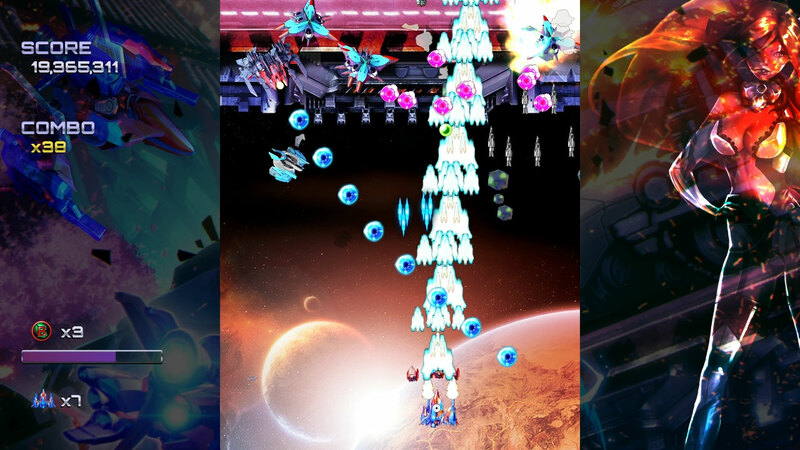 I’m quite grateful Ghost Blade elects to perpetuate this trend because it translates so well to the shorter, replayable campaigns characteristic of archetypal bullet hell shooters. Having said this, I fear Ghost Blade HD won’t test newcomers with its intentional challenge alone. 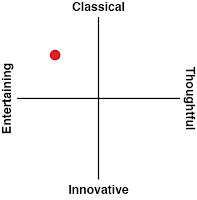 Even as someone reasonably well-versed in the genre, I found my early struggles hinged more on deciphering the art than actually overcoming the patterns presented to me. Enemy weaponry here comes in all shapes, sizes, and colours. When combined with gaudy background colour choices, objects that pop out from a separate plane, floating debris effects, and innumerable collectible items, however, it can be a sensory overload. The kaleidoscopic variety breaks up the visual monotony that some bullet hell outings do indeed suffer from, but from a practical perspective, it’s distracting in key moments. Tinkering with the game’s graphic settings alleviated this somewhat, but it took more time to become cognisant of my surroundings than games that feature genuinely oppressive patterns and enemy placement. This is not ideal for a genre in which precision and quick reflexes are championed. Thankfully, the game features a rare practice mode that allowed me stop and assess what was choking me up. Because of the sometimes unclear visual design, this is a game that benefits massively from TATE mode (vertical screen orientation), which is generously included in an option menu. 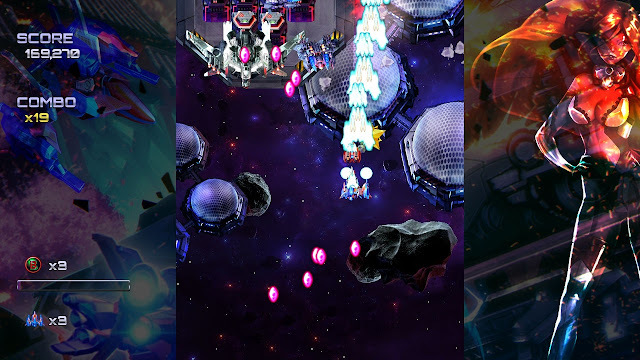 Though I am happier than most people to play vertical shoot ‘em ups with borders around the action, Ghost Blade HD is immeasurably more enjoyable with that increased screen estate. For this reason, I suspect the PC and Wii U versions will be more accessible unless you have an easy way to flip your television. The soundtrack is one of dramatic build-up, chugging along to give the game a pulse but never be overbearing. With some compositions from Rafael Dyll of Rainbow Moon fame, it’s got an electronic heart that never stops beating. 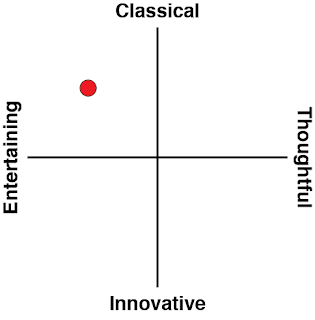 I gravitate more towards fiery, rousing anthems for these sorts of games, but this is a matter of preference, not a criticism. One helps stabilise the player to improve concentration while the other gets the adrenaline pumping in tight situations. What's clear is that the music captures the 90s vibe and that can only be a good thing considering this game’s overall mission statement. I won’t remember the beats and hooks as well as a game like Mamorukun Curse, but it wonderfully underscores the action in context nonetheless. Ghost Blade HD lovingly embraces the history of bullet hell shooters, providing classic substance with modern polish. Though these modern aesthetics proved vexing at times, it’s an experience worth seeing through.